Presented here is a Sparking Lamp, also sometimes called a Courting Lamp. 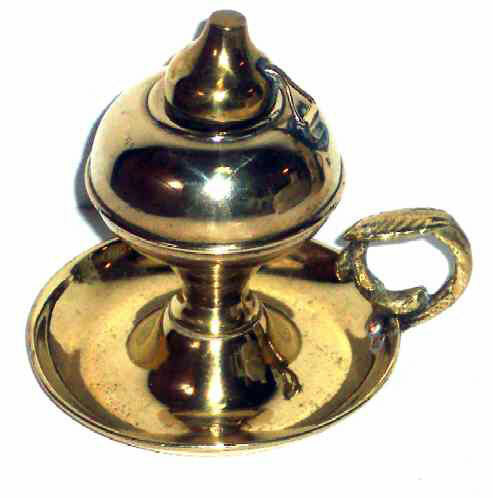 This dainty little lamp, equipped with a single screw whale oil borner has a spun saucer base and ornate cast brass handle with thumb grip as well as a hinged cover for the wick. It is 4" high and the base is 3-1/2" in diameter and circa 1830. Story has it the lamp was lit when the suitor came calling and had to leave when the lamp went out. Like a chamberstick, these were also used to light one's way to bed. The condition is very fine condition.